Intro: Take to the Rugby pitch and show your kicking skills in this target smashing extravaganza. Hear the roar of the crowd and watch the fireworks blaze overhead as you kick your way to a new high-score. Line up your kicks like a PRO in two gorgeously presented World Rugby stadiums. As a PRO Rugby player you’ll be expected to kick from every position on the pitch and cope with a variety of conditions from calm to extremely windy? Smash, explode and fire rockets at the floating targets to score BIG and compete with the best on the global leaderboards. 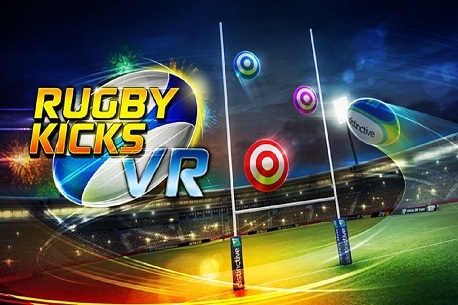 Verdict: Rugby Kicks VR is a target shooting challenge game that gives you a rugby ball and you need to kick it from the goal line into one of the targets. There are small ones, big ones and even some bonus ones like moving arms, blimps and the odd bomb! While it isn’t the full rugby game us fans would want it is still a pretty good game. It’s even fun for anyone into American football! While this game is indeed simple fun and worth a download, it’s not the Rugby game I wanted. I wanted a full Rugby game where you play a full game, only sat high up in the stadium, or maybe something like that. Sure, this kills some time, but that killer rugby and football game are still to appear and the longer it doesn’t the more doubtful I am that it ever will. Still, this is a fun little mini-game to tide us over until something better gets made.